Automatic Braking – Many of the vehicles offered by our dealerships feature systems that sense when there is imminent danger and slow down accordingly without you even having to raise a finger… or a foot in this case. Backup Assist Technology – The backup camera has become a mainstay in today's vehicles. In addition to the backup camera, other technologies can help assist the driver in this often vulnerable state. Take reverse sensors for instance. As you're using your backup camera sensors indicate when someone or something made suddenly whisk behind you that you weren't aware of and give you the opportunity to avoid potential disaster. This technology also lets you know when you're approaching obstacles such as cones, parking obstacles, as well as other vehicles. Blind Spot Technology – Again, using sensors and enhanced technology, the driver is made aware when they are signaling or attempting to move into another lane when another vehicle is in their blind spot, allowing the driver to avoid a potential accident. Automatic Parking – This technology helps make the terror of parallel parking or trying to squeeze your vehicle into a tight spot a thing of the past. Many vehicles simply instruct you to a starting point, then you push a button, take your hands off of the steering column, and voilà, the car will automatically park itself. If only they let you do that during the driving test at the DMV! Automatic Adjusting Headlights – you might not think of this is a safety feature, but the fact of the matter is this technology alone has been cited to decrease insurance claims. Basically adaptive headlights help the driver see better when negotiating a curve. Frontal Collision Avoidance – this self-explanatory technology uses the same features cited in the first three categories mentioned only in the front of the vehicle. 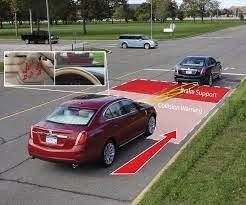 This can also assist the driver to avoid causing a rear end collision. It is used in adaptive cruise control to help the driver maintain a safe distance from themselves and the vehicle in front of them without having to disengage their cruise control. These are just a few of the many safety features that the Olympia Auto Mall is proud to offer. To experience the brand-new safety features available to you first-hand come by our showroom. Our expert staff is ready to help you find the new or used car or truck that meets your needs. True, a new car can't buy you peace of mind, but we like to think it might be able to help you worry about a few less things in life so you can focus on what's most important. Whether you're looking for new or used cars in Tacoma, WA the Olympia Auto Mall is your premier choice. The Olympia Auto Mall – Washington's Largest!! !